Brian Rock – Singer/Bass – Born in Roseau, Dominica before the Bob Marley days of reggae, Brian Rock grew up listening to the exotic sounds of local musicians from the streets and beaches of his homeland. 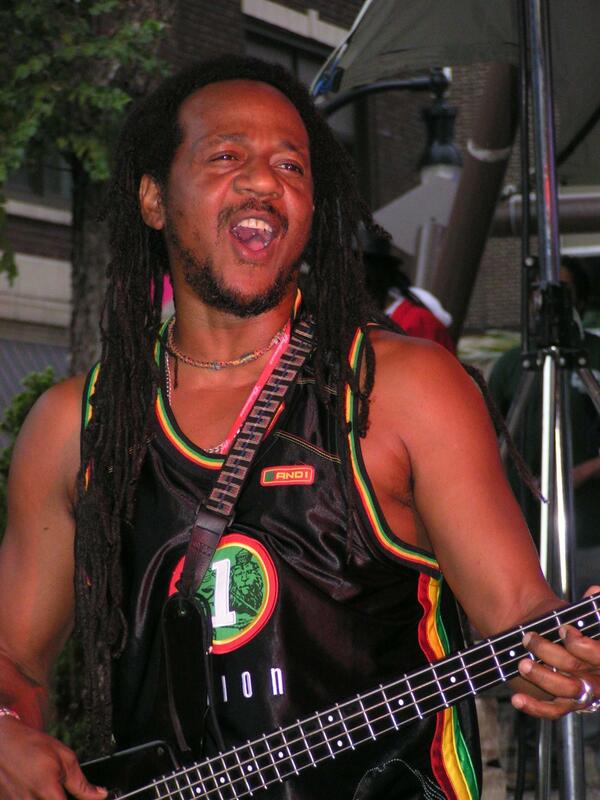 As reggae developed and soon became popular, Rock was already playing any instrument he could land his hands on. Writing, composing and arranging music was what came next. Rock began singing and performing in the US with several bands in the 70’s and was doing odd jobs during the day to make ends meet. The gigs started coming more often, and the drive to make it professionally took over. 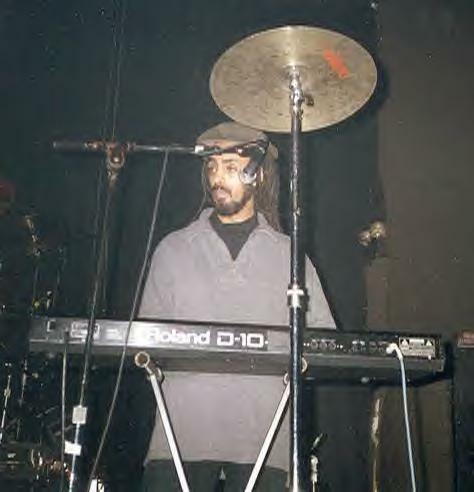 Rocket was touring with Moja Nya at the time, playing gigs alongside Dallol, which housed Ruphael, Asrat and former Gizzae keyboardist DJ. Rock has been pulling double-duty singing and playing bass for the last 7 years with Gizzae and wouldn’t have it any other way. 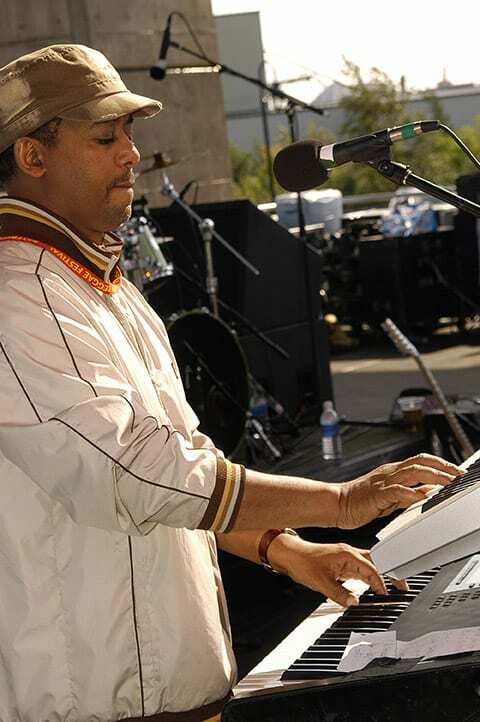 Ruphael W. Mariam – Drums/Keys/Vocals – Two time Grammy award winner Ruphael W. Mariam was born in Addis Ababa, Ethiopia to a very large family of 2 brothers and 7 sisters. Being one of the youngest made Ruphael realize that there are myriad paths that can be taken in life. “Ever since I can remember, I knew that my life would be dedicated to the Arts” Ruph has never looked back and has had a lasting and prosperous career as musician and artist. Ruph began drawing and painting by the tender age of 4. Through the years his teachers noticed that he had talent, not only with painting and drawing, but also as a musician. He enrolled at an art school at night while he attended high school during the day. The schedule was soon flip-flopped to accommodate his yearning to become a professional musician and artist. Already a capable guitarist and bassist, Ruph was also becoming an accomplished drummer. Coincidentally, a local band was looking for a drummer to play Top 40 hits for the local hotels. That was it. Ruph had begun playing professionally at the age of 14, and was fast becoming hooked on the emotion of it. Ruphael moved to the US in 1979. Asrat also came over after leaving the popular band The Sensations, to explore other music opportunities. Together, they started a band called Dallol with several other mates from Ethiopia. Rita Marley noticed their progressive sound and conscious lyrics and signed them to a record deal. Soon Dallol was on the road with Ziggy Marley for several World Tours from 1986-1990, opening for such acts as: U2, Bruce Springsteen, Gun’s N Roses, Phil Collins, Iggy Pop, Boy George and many others. Winner of 2 Grammys® for best reggae album with Ziggy Marley (One Bright Day and Conscious Party) a gold and a platinum record, Ruph is still bringing it strong with Gizzae now playing keyboards and occasionally drums. Ruph also played drums in the last few years for Ziggy Marley on his World Tour. Some of Ruphael’s artwork is proudly displayed at the Wild Hare, which he co-owns as well. He has also done all of the logos for Gizzae and artwork for several musicians. 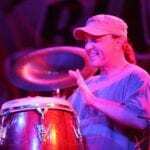 Jason ” Jah Son ” Litwin – Percussion & Vocals – Born in Chicago I was blessed to be surrounded by music. My Grandmother, Sylvia Litwin was a classical pianist, dance teacher and also a music teacher. She taught piano and organ from her basement. I have great memories of learning Bach, Beethoven & Mozart by the beautiful melodies coming up through the vents in her house from the basement. My Father, Howard Litwin was a school teacher, but also played guitar, harmonica and sang. Chicago is a huge melting pot of music and I was blessed to be also raised with music everyda0, everywhere, anytime , anyplace, all the time. I didn’t choose the drums, percussion, they choose me. 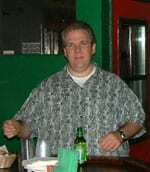 I have been playing and recording music professionally for 25 years. I have recorded and played and shared stages with too many to try and name drop ..but I guess it’s called a resume.. I have recorded and toured with The Freddy Jones Band ..Poi Dog Pondering, Widespread Panic, Mr.Blotto, Michael Franti, Merl Saunders and can’t forget about a band I have been playing and touring and recording with for 17 years..GIZZAE! Asrat Selassie – Drums/Percussion/Vocals – A two time Grammy® award winner (Ziggy Marley Best Reggae Album, One Bright Day and Conscious Party) Asrat has been touring the world pretty much his whole life. On the road with (Dallol) Ziggy Marley, sharing stadiums with Bruce Springsteen, Guns N Roses, INXS has given Asrat a taste of our world. Any part of Europe, the Caribbean, The US, Canada, Africa, Australia, he has been there. Asrat was born in the desert lands of Ethiopia where people would share space with lions along with black mambas and all the things we would run screaming from. A truly humble and spiritual person, Asrat has managed world tours, a thriving night club, family and still maintains his calm presence. He is also a graceful classical pianist and capable guitarist. Buy him a cup of coffee and ask him about his homeland. His stories are engaging, entertaining and educational. Asrat is truly a man of the world. Ralph Mote – Keys/Vocals – Ralph is a long time reggae veteran and has jammed with some of the biggest names in reggae. He has dedicated his life to music and will jam with anyone that wants to play. Ralph adds an entirely new dimension with his style of keyboarding. Sometimes jazzy, sometimes funky, Ralph’s harmonic textures have further helped to form the “Gizzae Sound”. Ralph has surely made his mark on the band and is a welcomed addition. Ralph also continues to write and produce for his company, Clear Vision Music. He has produced many “spots” for TV and radio, as well as collaborate with many new and aspiring artists. Ralph is a true wonder to see live coupled with the already great chemistry and talent Gizzae has. Come check him out some night. 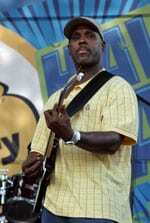 Clem Julien – Guitar/Vocals – Clem was born in Marigot, Dominica into a musical family. His Father was a singer and his older brother Daniel also was a musician. Clem started playing professionally at age 19 with a popular band named “Ignition” where he toured the Caribbean islands for about 5 years. A trip to the US landed Clem the lead guitar spot with Bell Combo back in the late 70’s and early 80’s. From there he hooked up with a very big band named “Swinging Stars” for a few years in the 80’s, and that is where he and Rocket crossed paths again. Clem went back to play for Mighty Arrow and Mighty Baron in Trinidad and Martinique for the next few years. He finally found his way back to Chicago and met up with Rocket and what was left of Dallol where they all formed Gizzae. Clem brings some phenomenal licks and harmony in the band. Some say his playing is Santana like. Most would agree. Clem also plays and records contemporary jazz at his newly built home studio in his downtime. Clem has 2 daughters Nicole and Jamilah. Influences were/are: Bob Marley, George Benson, Earl Klugh, Stevie Wonder, Al Jarron, Larry Carlton and Wes Montgomery to name a few. 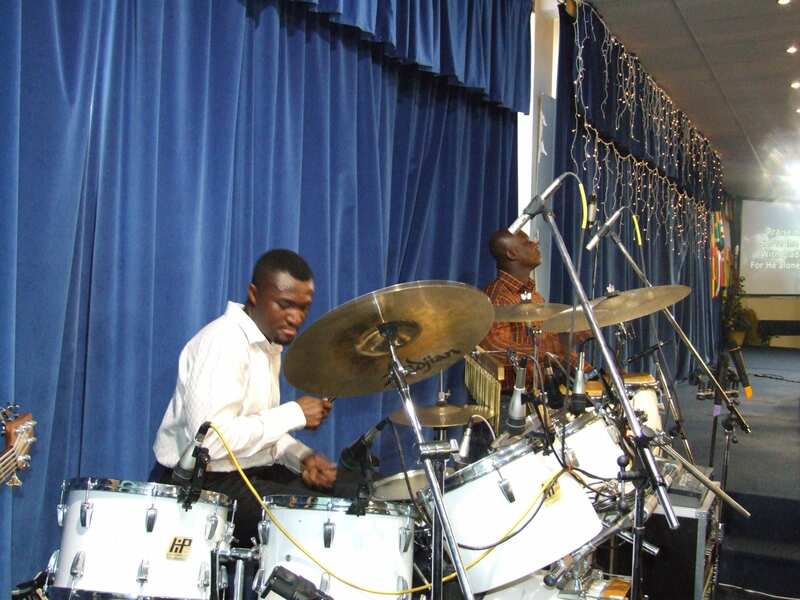 Evans Atta-Fynn – Drums/Keys/Vocals – Evans was born in the twin cities of Sekondi-Takoradi, Ghana, Evans is a fine example of a musician who’s musical talent emerged early in his childhood as he picked up the drums at the age of eight by playing the congas at church in Ghana. At the age of 15 he began dividing his time between school and his grandfather’s band “Osamarima” where his father played the guitar in the late 80’s and early 90’s. In 1991 officially he became the Osamarima band’s percussionist. In 1992 he joined the Western Diamonds, Ghana’s best known Hi-Life band, recorded 3 albums and toured the United States, the United Kingdom, various African countries as well as Europe. Evans moved to Chicago in 1997 with the Western Diamonds and has been a member of Dansika and Hydro reggae band, and has backed up many artists national and lnternationally such as the legendary Sony Okuson, Sammy Okposo, Daddy Shokey, all from Nigeria, Africa, annd Bushman from Jamaica. Evans loves to pound the skins and can easily be persuaded into a drum solo that will leave you slack-jawed.